It doesn't really matter what else I plan to pack in Ruby's lunch this Halloween, these mandarin orange jack-o-lanterns will be making an appearance. They might even make an appearance for the whole preschool class. To be enjoyed before eating some disgustingly sweet Halloween birthday treat that has yet to be decided on. 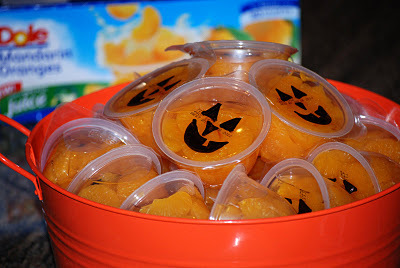 You can check out this fun idea for mandarin orange pumpkins (and lots of other great recipes) over at Pimp My Dinner.